Closed Mondays, major holidays, and during installations. Weekend tours happen every Saturday and Sunday at 1 p.m. unless otherwise noted. Tours last approximately 30 minutes and are entirely free. The Cornell Fine Arts Museum offers Throwback Thursday Tours during Rollins College Common Hour on the third Thursday of the month. Join the Museum as we reflect on the past while delving into various historical artworks on view. 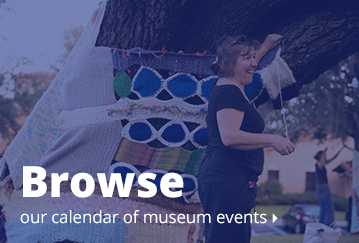 Each docent-guided TBT tour explores new artworks and themes. Happy Hour Tours at The Alfond Inn occur the first Wednesday of each month. Join a museum staff member for a guided tour of selections from The Alfond Collection of Contemporary Art on view at the inn in Winter Park. Meet in the lobby for the tour which lasts about 45 minutes, then enjoy happy hour in the lounge area of Hamilton's Kitchen. Groups must submit a reservation request at least 10 days in advance. Interested parties please contact Dale Montgomery Fellow, Elizabeth Coulter, at ecoulter@rollins.edu or call 407-691-1649. Please call or email at your earliest convenience to address cancellations or changes. On the day of the tour, if the group has not arrived by 30 minutes past the scheduled starting time the tour will be canceled and must be rescheduled for another day. 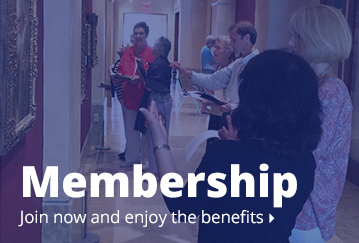 A private after-hours tour for six with the Museum’s curator is available for museum members at the Benefactor level and above. Details on membership can be found on the Get Involved page.